This is another in the Five Quotes series on this blog, but I first have two preface the quotes with a couple comments. Firstly, I just wanted to say that I found the above photo at St. Francis Place. 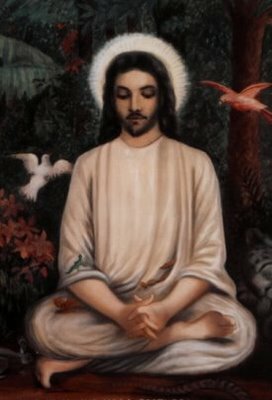 I chose the photo because I do believe that Jesus meditated (there are plenty of resources for this but the post at St. Francis Place is a good one). I also believe that Jesus studied in India with the spiritual masters of his time; many refer to this as the Lost Years, or more specifically, the years which the Bible is silent on the life of Jesus. It is also likely that December 25 is not the actual birth date of Jesus, but as Christians this is the day we celebrate it. At any rate, whether you are a Christian or not, you have to admit that if more of us (myself included) followed the teachings of Jesus--lived them--the world would likely be a better place. Anyhow, these--in no particular order--are just a few of His words that inspire me. The Kingdom of the Father is spread out upon the earth, but men do not see it. "I also believe that Jesus studied in India"
Although I don't think it's out of the question, I think it rather more likely that it is as the texts state, that he went to Egypt. But "going to Egypt" then would hold a different connotation than it does now. To a Jew of the time "going to Egypt" would mean going to Alexandria, the largest Jewish city in the world ( a quarter million of the half million population) and, of course, Alexander's great library and university city. The library contained copies of all significant texts from northern India and there were not a few Indians there as well. While nothing precludes the idea that he might have gone to India, everything he needed to gain both knowledge of, and training in, Indian philosophy was right there in Egypt. Hi KFG, Nice to hear from you...been a while. I believe he did go to Egypt...but also to India. But then again these are just my beliefs...a lay-person like myself has no real facts. "Nice to hear from you...been a while." And my apologies for disappearing on a provocative note, but as the man said, sometimes life is what happens while you're busy making other plans. Your supposition that I am male was correct, for what it's worth. I'm not sensitive to the issue though so if you'd got it wrong, no biggie. I'm perfectly happy existing on the Internet as mind expressing itself in symbols. "these are just my beliefs...a lay-person like myself has no real facts." Understandable, as the experts have no more real facts at hand. I'm just applying Occam's Razor, he could have, the road at the time being open and well traveled, but didn't need to. What is clear from the texts (as can be seen from the consequences alone) though is that his philosophy was odd to the point of being largely outside Jewish tradition and was rather, well, Buddhist.